I've had this bold punchy printed skirt in my wardrobe for well over a year and yet somehow had never reached for it till now, despite what a huge sucker I am for tribal prints. To be fair, my closet situation is the messiest most unkempt wardrobe situation that has ever existed (just trust me on this), so it was kind of lost and forgotten under everything else. Until today, when this lucky skirt finally got its chance to shine. I envisioned celebrating its auspicious coming-out party with some bright, sun-drenched photos but unfortunately by the time we got around to breaking out the camera, the sun was hidden behind streaks of clouds. Darn that sneaky marine layer. JK I have no idea if that's what it was or not. But, at least it made the sunset a bit more ambient. 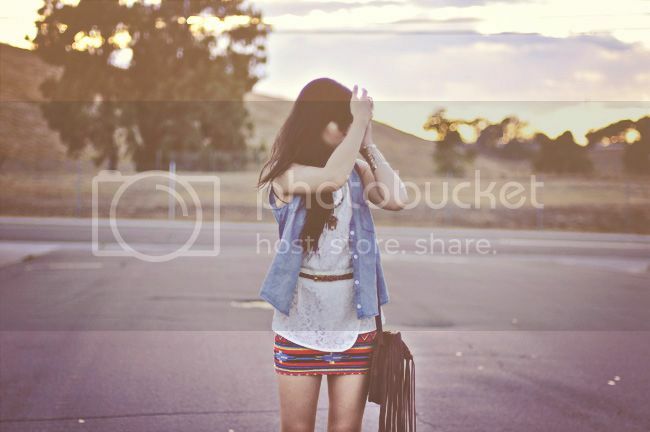 Sleeveless chambray button-up and southwestern print skirt, Forever 21. Lace peplum top, c/o Sugarlips. Skinny leopard belt and cat-eye sunglasses, Asos. Feather necklace, custom by Skydancer Feather Designs. Southwestern ring, Urban Outfitters. 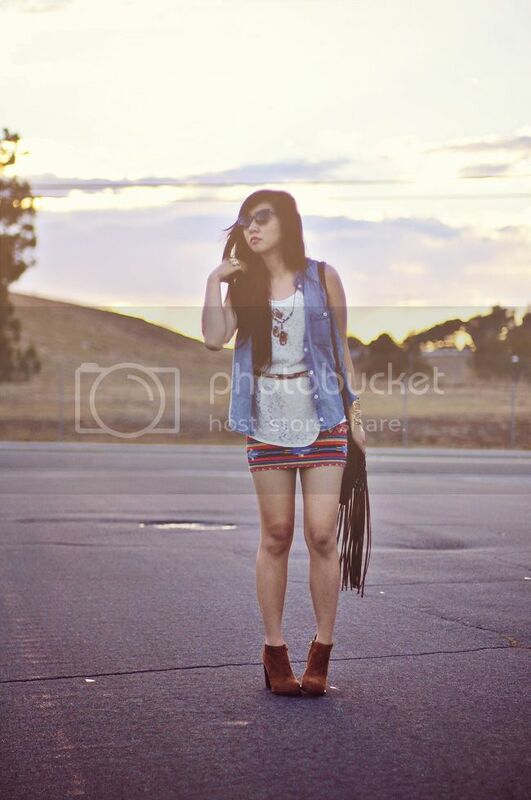 Fringed leather cross-body, American Eagle. 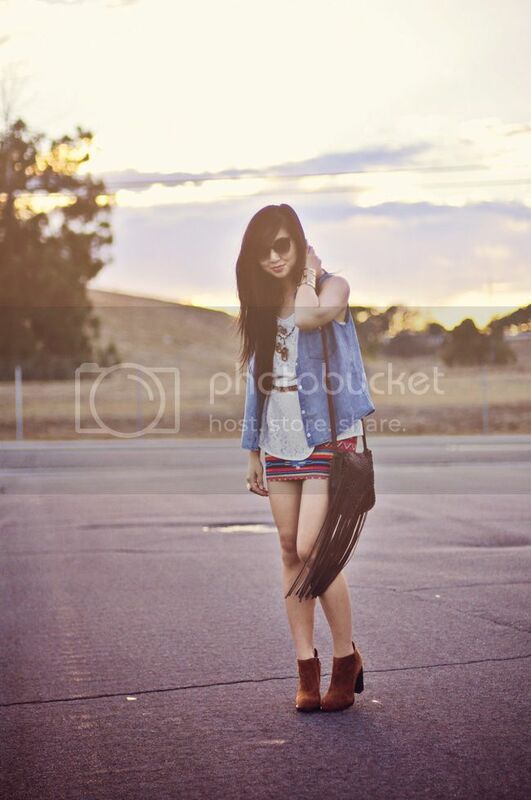 Suede ankle boots, Jeffrey Campbell. 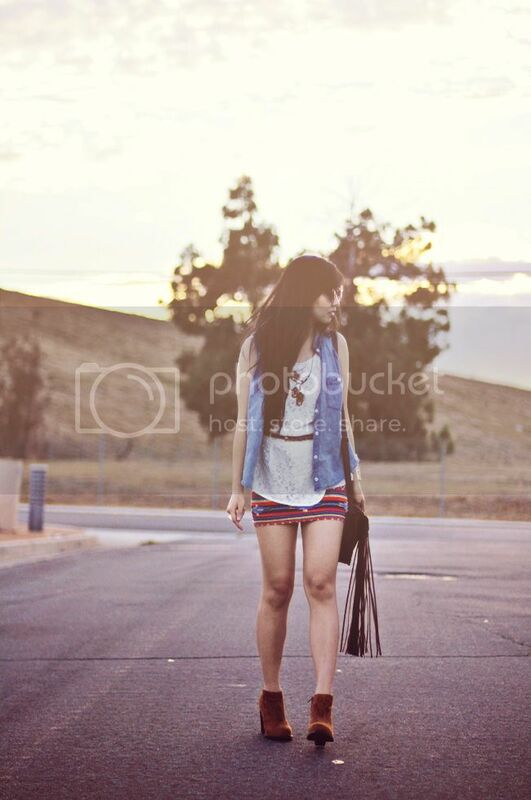 This is so gorgeously bohemian casual, I love the bag and boots with the aztec skirt. OMG!!! 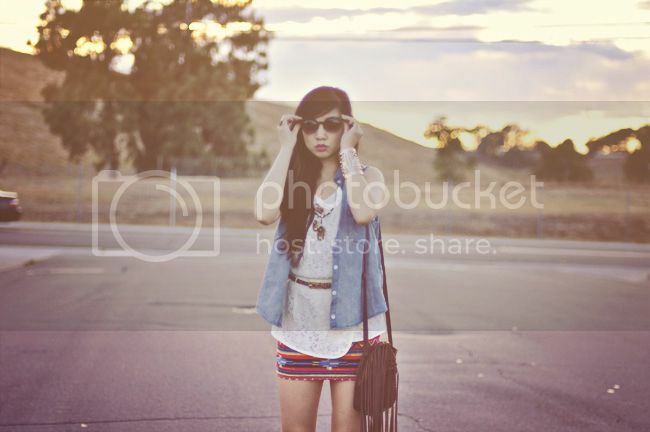 I like this look and style of photos!! Those boot are so awesome! They would be great with boyfriend or skinny jeans later in fall, too. These photos are gorgeous, as usual! I'm loving this printed skirt!! I know the feeling of having so much in your closet you forget all the treasures in it. Glad this skirt finally got a chance to be worn! I love your outfit! The skirt is gorgeous! absolutely in love with your outfit.. 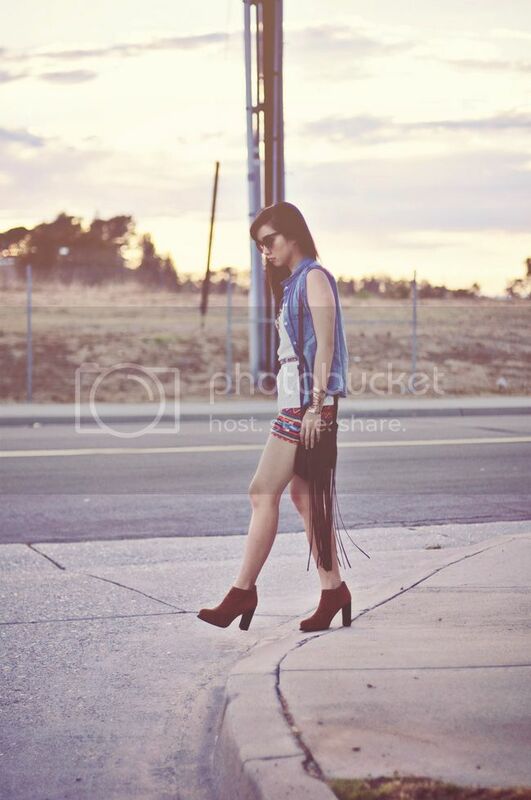 The outfit is great and pics are so editorial, love them. Well styled. 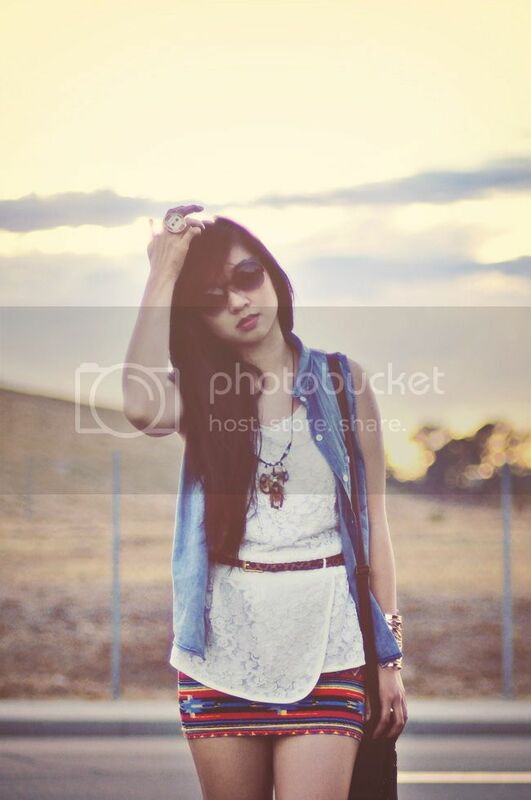 thanks for the request on ifb :) i love your skirt ! OH - I LOVE everything about this outfit! The lace shirt is too ADORBS, and that purse - LOVE IT! WANT IT! NEED IT! i love those boots!! i think I need them. are they comfortable? Yes they are comfortable!! And I got them on clearance for only $40!